Impact of change of venus in Sagittarius zodiac, what changes may take place when shukra changes its rashi on 29th January 2019. Venus is also called Shukra in hindi jyotish. In gochar this planet is in scorpio but in the night of 29th January 2019, i.e. on Tuesday night, venus will change zodiac and enter in sagttarius, due to this many positive changes may comes out in life. As per vedic jytish, venus is related mostly with personal life like as materialistic happiness, entertainment, love etc. so when venus enter in Sagittarius zodiac then many good changes will make life happy, people may get time and things to enjoy life. Although shukra will sits with moon and Saturn after changing rashi and make Trigrahi yoga but since Saturn and venus are friends so not to worry much. Let’s see some changes which may be seen as per astrology? 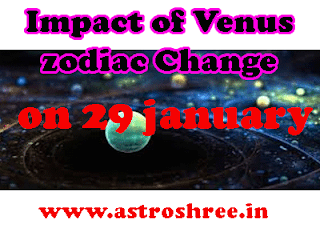 People who have their zodiac master venus may feel very good changes in life because shukr will enter in sagittarus rashi which is friend zodiac of it. If venus is positive in your horoscope then no doubt this change will enhance your life with entertainment tools, love, happiness, luxury etc. Changes of zodiac by shukra is also good for laxmi saadhna, if anyone is facing financial problem then it is good to start laxmi pooja from this Friday. The rashi change by venus will also make good changes in Market, people will spend more for luxury and so flow of money will be seen in coming days, so this will help businessmen too. So overall the impact of venus in Sagittarius is good for everyone. Flow of money will increase, happiness will increase, good environment will also help every one.